Most of Europe basked in sunshine throughout April which got the rhubarb growing much earlier than usual. 6 days after I spotted the first growth we had usable stems! 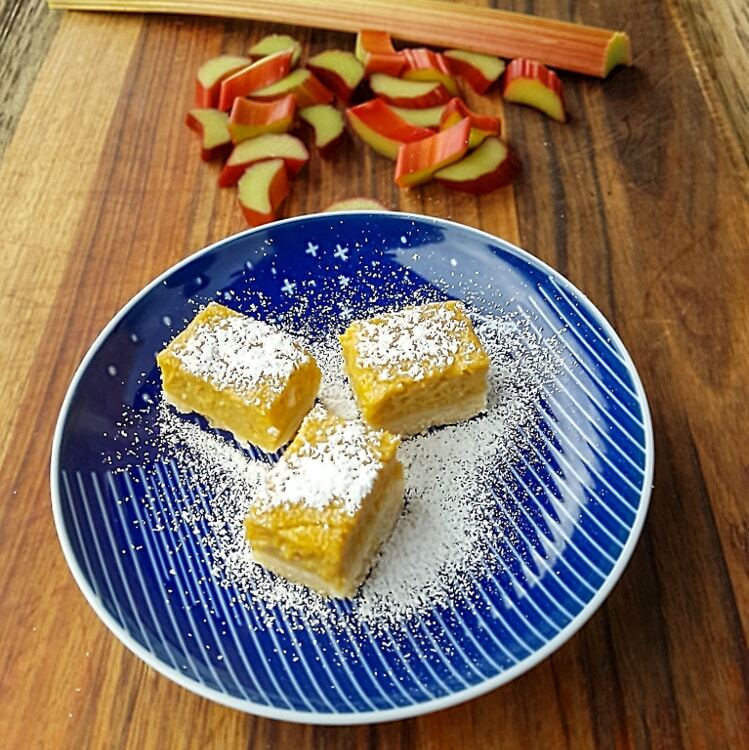 Following on from my goal last summer not to waste a stick of rhubarb, here is the first rhubarb recipe of the season. Slice, in a biscuit / afternoon tea form was completely new to us until we moved to Australia where there are literally, 1000’s of recipes for slice. It may seem like double the effort; baking the biscuit base and then the topping but the bonus is the 2 textured result. Despite that, they are easy to make, keep well, go a long way and super versatile as you can mix and match recipes quite easily. I use the same biscuit base here as for the Almond Slice in our cookbook. Pre heat the oven to 180°C and line a 20cm square baking tin. I like to use re-usable liners but baking paper wil do the trick. Leave the liner hanging over the sides so you can lift the slice out easily after cooking. To make the base, place the flour, icing sugar and butter in a food processor and blitz for around 15 seconds until the butter is rubbed into the flour and you have a breadcrumb like texture. It’s best to pulse the food processor and keep checking the mixture – you don’t want it to become a dough. It is ready when you can press the mixture between two fingers and it stays together. If you don’t have a food processor, you can do this step by hand by rubbing the butter and flour between your fingers in a large bowl. Put the mixture in the tin and spread it evenly, pressing it into the base using the palm of your hand until it is even. While the biscuit base is cooking, wash the rhubarb stems and slice 1cm pieces or smaller of the red part of the rhubarb. Discard the green part. Put the rhubarb into a heavy based pan with half the sugar, ground and fresh ginger (if you love ginger, add more!) and the vanilla. Cook on a medium heat for about 10-12 minutes stirring occasionally until the rhubarb is completely soft. Move the mixture to a cool bowl or jug, remove vanilla pod if used and let cool for 5 minutes. Puree with a hand blender. In a separate bowl or a food mixer, whisk the eggs with the remaining sugar, add the rhubarb puree and mix through. lastly, add the cornflour and whisk until all combined. Pour the mixture over the biscuit base and pop back in the oven for 30 minutes. It is ready when the top stops wobbling. 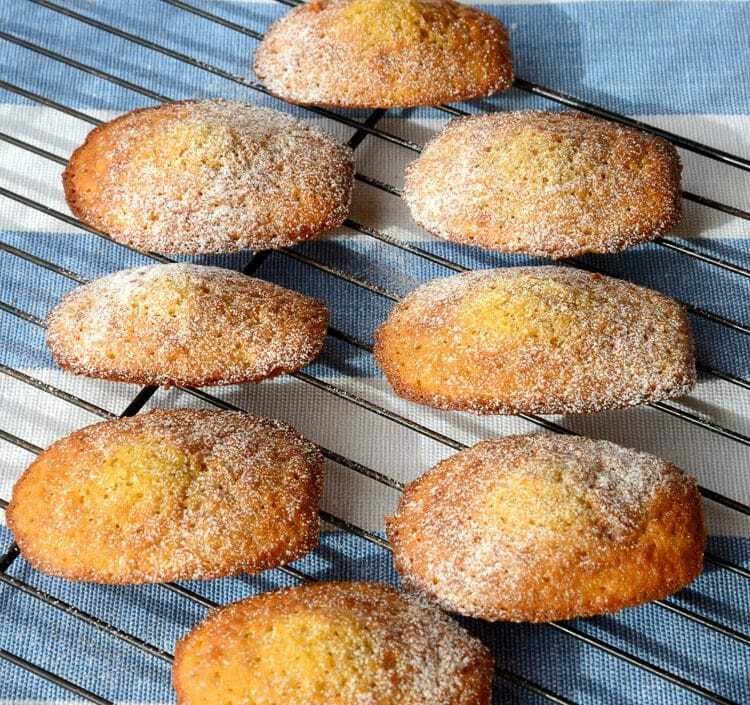 Enjoy at room temperature with a little dusting of icing sugar.